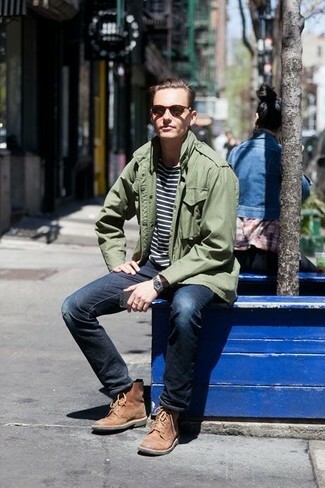 If you're scouting for a casual yet stylish look, try teaming a Frame pc slim fit military jacket with black jeans. Both items are totally comfortable and will look great together. Throw in a pair of grey suede low top sneakers to make the ensemble current. 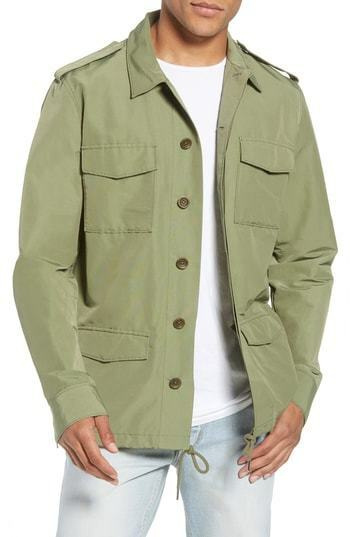 If you're hunting for a casual yet on-trend outfit, team a Frame pc slim fit military jacket with blue jeans. Both garments are totally comfortable and will look great together. Add a more relaxed vibe to your look with white low top sneakers. If you're scouting for a casual yet dapper getup, team a Frame pc slim fit military jacket with light blue jeans. Both pieces are totally comfortable and will look great paired together. Kick up the cool of your outfit by rounding it off with beige suede loafers. 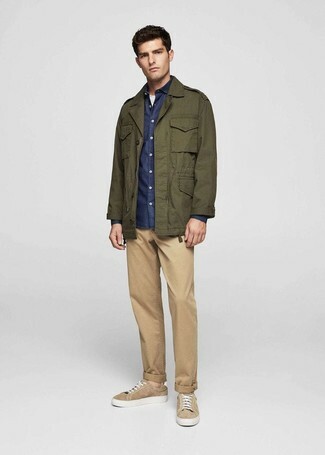 If you're on the hunt for a casual yet on-trend getup, reach for an olive military jacket and khaki chinos. Both pieces are totally comfortable and will look great paired together. Break up your look with more casual footwear, such as this pair of tan suede low top sneakers. 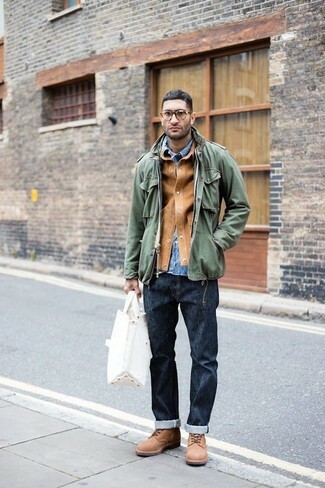 If you're after a casual yet stylish ensemble, try teaming an olive military jacket with navy jeans. As well as very comfortable, both garments look wonderful when paired together. Wearing a pair of brown suede casual boots is an easy way to add extra flair to your outfit. If you prefer comfort dressing when it comes to your personal style, you'll love this simple combination of a Frame pc slim fit military jacket from Nordstrom and navy ripped skinny jeans. Tap into some David Gandy dapperness and complete your ensemble with tan suede casual boots. 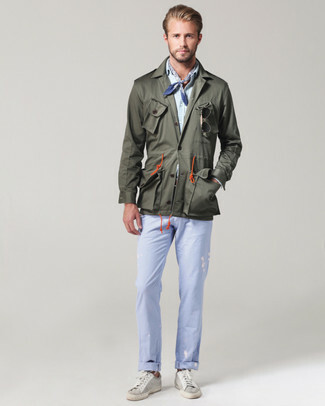 If you're hunting for a casual yet stylish look, consider wearing a Frame pc slim fit military jacket and black chinos. Both items are totally comfortable and will look great paired together. Add a more relaxed feel to your outfit with black leather high top sneakers. If you're on the lookout for a casual yet seriously stylish getup, opt for a Frame pc slim fit military jacket and light blue chinos. Both garments are totally comfortable and will look great paired together. 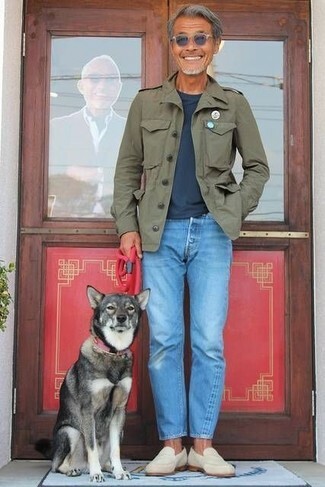 For a more relaxed take, opt for a pair of grey suede low top sneakers. 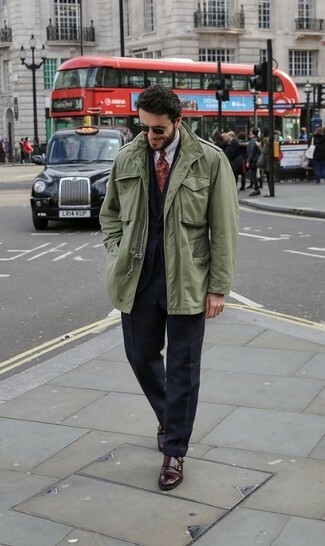 Consider pairing a Frame olive military jacket with a black check suit for a sharp classy look. Dark brown leather double monks are a savvy choice to round off the look.